On July 31, 1803, Swedish-American inventor John Ericsson was born. Ericsson is regarded as one of the most influential mechanical engineers ever. 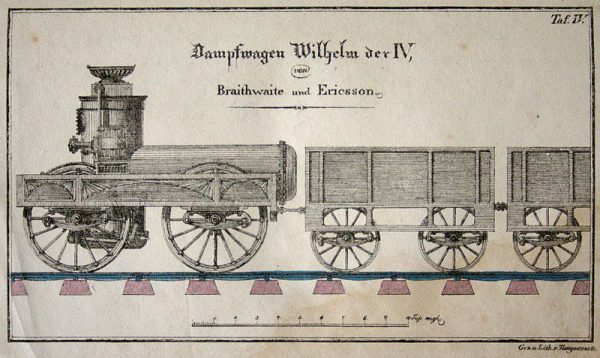 Ericsson collaborated on the design of the steam locomotive Novelty, which competed in the Rainhill Trials on the Liverpool and Manchester Railway, won by George Stephenson‘s Rocket. 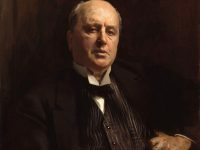 In America he designed the US Navy’s first screw-propelled steam-frigate USS Princeton, in partnership with Captain Robert Stockton as well as the first armoured ship with a rotating turret, the USS Monitor. John Ericsson grew up in Sweden, he was the brother of the distinguished canal and railway builder Nils Ericson. The Ericsson brothers and their skills were discovered by Baltzar von Platen, the architect of the Göta Canal. They were dubbed ‘cadets of mechanics’ of the Swedish Royal Navy, and engaged as trainees at the canal enterprise. At the age of fourteen, John was already working independently as a surveyor. He joined the Swedish army at the age of 17 and served in the Jämtland Field Ranger Regiment, as a Second Lieutenant, but was soon promoted to Lieutenant. His skill and interest in mechanics made him resign from the army and move to England in 1826. 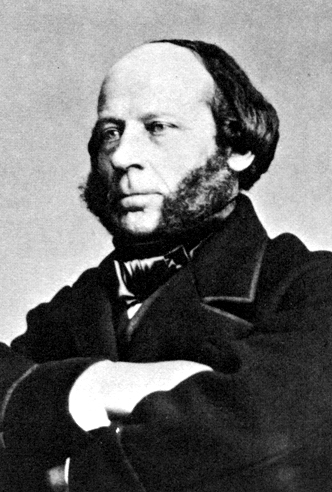 John Ericsson (1803 – 1889), Swedish-born inventor. Original print in possession of National Archives. Ericsson began to invent several mechanisms based on steam, improving the heating process by adding fans to increase oxygen supply to the fire bed. Ericsson began collaborating with John Braithwaite, and together they created engines like the ‘William IV’ and ‘Queen Adelaide’. They ran trials on the Liverpool and Manchester Railway but the railway declined to purchase the new designs. Their steam fire engine was a technical success and helped to quell the memorable Argyll Rooms fire. However, it faced resistance by the municipal authorities. John Ericsson devoted much of his time to propeller design. He developed two screw-propellers moving in different directions on a ship. The Admiralty disapproved of the invention, which led to the fortunate contact with the encouraging American captain Robert Stockton who had Ericsson design a propeller steamer for him and invited him to bring his invention to the United States of America, as it would supposedly be more welcomed in that place. Ericsson moved to New York in 1839. Stockton’s plan was for Ericsson to oversee the development of a new class of frigate with Stockton using his considerable political connections to grease the wheels. Finally, after the succession to the Presidency by John Tyler, funds were allocated for a new design. Unfortunately they only received funding for a 700-ton sloop instead of a frigate. The sloop eventually became USS Princeton, named after Stockton’s hometown. The ship took three years to complete. 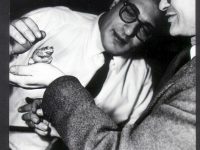 However, it is believed that the working relationship between Ericsson and Stockton had grown tense over the years and Stockton wanted Ericsson out of the project. It is further assumed that Stockton attempted to claim as much credit for himself as possible. When launched, Princeton was an enormous success. On October 20, 1843, she won a speed trial against the paddle steamer SS Great Western, until then considered the fastest steamer afloat. Unfortunately, during a firing demonstration of Stockton’s gun, the breech ruptured, killing Secretary of State Abel P. Upshur and Secretary of the Navy Thomas Walker Gilmer, as well as six others. 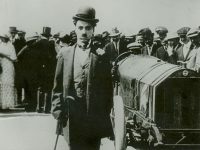 It is believed that Stockton wanted to blame Ericsson for the failure even though Ericsson’s gun was sound and it was Stockton’s gun that had failed. During the 1820s, John Ericsson invented the hot air engine which used hot air instead of steam as a propellant. A similar device had been patented in 1816 by the Reverend Robert Stirling, whose technical priority of invention provides the usual term ‘Stirling Engine’ for the device. Ericsson’s engine was not initially successful due to the differences in combustion temperatures between Swedish wood and British coal. In spite of his setbacks, Ericsson was awarded the Rumford Prize of the American Academy of Arts and Sciences in 1862 for his invention. However, later on his invention helped Ericsson to become quite wealthy since the boilerless design made it a much safer and more practical means of power for small industry than steam engines. Later on, Ericsson designed other naval vessels and weapons including a sort of torpedo and a destroyer, a torpedo boat that could fire a cannon from an underwater port. Further, Ericsson provided technical support for John Philip Holland in his early submarine experiments. Ericsson also presented his sun engines that were able to collect solar heat for a hot air engine. John Ericsson died on March 8, 1889, at age 85.